(Newser) – New York's attorney general has announced his resignation after four women accused the Democrat of physically abusing them. 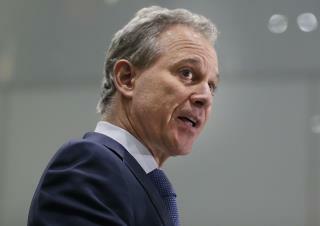 Eric Schneiderman released a statement late Monday saying the allegations will "effectively prevent him from leading the office's work" and he therefore will resign on the close of business on Tuesday, per the AP. Schneiderman says he strongly contests the allegations, which he calls unrelated to his professional conduct or operations of the office. Two of the women spoke on the record to the New Yorker. They say Schneiderman repeatedly hit them, often after drinking. A third woman who also was involved with him told her story to the other two women, but said she was too frightened to come forward. A fourth woman said Schneiderman slapped her when she rebuffed him but also asked to remain unidentified. The New Yorker said it vetted the third woman's allegations, and saw a photo of what the fourth woman said was her injury. The two women who spoke on the record, Michelle Manning Barish and Tanya Selvaratnam, both said the physical abuse escalated over time, including choking and hitting, and that Schneiderman also was a heavy drinker. That happened quick. Like he barked up the wrong tree, and someone pulled the blackmail card. Hard to believe no one knew. Dim and perv seem to be one and the same. Good. We're already over the limit for pigs and liars in government.